We hope that you all saw Installation Flora, a garden of flora and fauna made from primarily re-cycled material, during the 2017 Arts Festival. It had a great response from the Thomastown community and we would like to grow the concept next year into Installation Flora and Its Seeds. 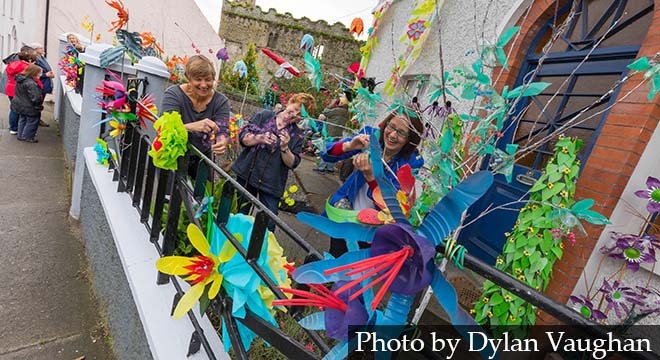 We would like to have multiple installations of re-cycled art throughout the Thomastown community for the Thomastown Visual Arts Festival 2018. We are hoping that your group might be interested in doing an installation of recycled art. We have loads of ideas and potential venues to choose from, as well as artistic and economic resources to offer. And, of course, we are happy with any new ideas that might interest your group. The original garden on Ladywell is already planning their 2018 installation and some local artists are considering individual installations around town. Installations created and installed by local community groups would be a great community benefit. We have successfully applied for funding from the Kilkenny County Council’s Environmental Department. The funding will pay for local artists to hold workshops with individual groups, demonstrating how to make the chosen type of recycled art. In addition, there will be some assistance with material costs, though, as this is re-cycled art, material costs should be a minimum. In addition to promoting creativity and our Thomastown Visual Arts Festival, we plan to use these workshops to educate groups on recycling and waste reduction. Our local environmental officer will be providing information on these topics as part of the project. The stone walls, on the lane between church and cemetery decorated… and many more! If we can obtain indoor display place, we could also have knitted flowers and items/flowers made from recycled holiday wrapping. 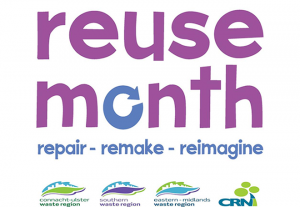 The project is being launched this month, as part of October Re-use Month. Please let us know if your group may have any interest in doing a project by sending an email to thownstowncommunitynetwork@gmail.com latest by Friday 27th October 2017. We would love to discuss it with you. Note: The number of groups will need to be limited to our budget.